The Digital Holster 5 from Think Tank is a holster-style bag with closed-cell foam cushioning that is designed to fit a small to medium mirrorless camera along with an attached lens measuring up to 3.3" (8.4 cm) long. This bag offers a variety of carrying options, including a top handle, an included shoulder strap, as well as the ability to mount it onto a modular Think Tank bag, beltpack, or belt. Additionally, it can be mounted to a standard belt. A camera placed inside the Digital Holster 5 can be easily removed using the quick-access top opening. A front stretch pocket can hold lens caps, back caps, and other small accessories. For larger accessories such as lens hoods, flashes, or filters, a zippered side pocket is provided. On the outside of the top lid is a compartment for business cards, while on the inside of the top lid is a pocket that can be used to safely store memory cards or a lens cloth. 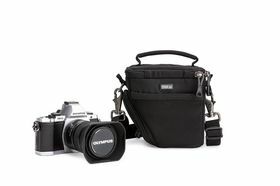 To protect a camera's rear screen while it is in the Digital Holster 5, a removable screen protector is included to provide a buffer against potential abrasion from shoulder straps that are connected to the camera and are tucked into the bag as well. Nylon construction throughout the bag and a polyurethane-coated bottom provide a high degree of built-in weather resistance, and a seam-sealed rain cover is included for even more protection from the elements should the need arise.